This page shows all the different items that are available for customization, and the page on the right shows the items that all subscribers will receive. I’d been a Clarisonic user for years, but last year I switched to Foreo thanks to the first time I sampled this device! Coola is probably my favorite sunscreen brand. Their formulas are ingredient-conscious, work well, and their scents are divine, too. Usually, I only see Coola in subscription boxes in the form of tiny samples, so I was thrilled to see a full-size product in this box! This formula is certified organic, vegan, and gluten free. Plus it is a moisturizer + SPF 50 in one! The cream formula blends in easily to give you a clear finish, the white tea scent is light and lovely, and no greasy finish! This is a glazed ceramic trinket dish with a marble design. I always love when a subscription box includes a home item, and I think this is a perfect fit for that category. It’s simple, classy, and can work as a jewelry tray, a soap dish, or in my case, a place to wrangle all my lip balms. Next up, we have the Choice items. If you aren’t familiar, every season, FabFitFun allows subscribers to pick their choice between different items to customize their box! All subscribers will be able to pick between this towel (in one of two prints) or a Yumi Kim train case. (I’ll show you all the other options at the end of the review.) You have until May 18th at 11:59 PM PST to make your selection. This is a microfiber towel, so sand won’t stick to it! It’s also super soft and oversized! It measures 39 X 72 inches. I love this tropical print so much! So bright and cheery! All subscribers will be able to pick between this gel, a ring, or a body scrub. (I’ll show you all the other options at the end of the review.) You have until May 18th at 11:59 PM PST to make your selection. If you are a fan of lavender essential oil, I highly recommend picking this item! It’s an ingredient-conscious gel formula that is so light and soothing! Do you ever get a beauty product that has such a great scent that you can’t stop smelling it? That’s what is happening with me with this muscle gel – I keep smelling my arm where I applied it! Next up, we have the Select items. 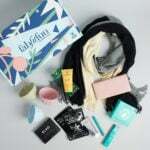 If you aren’t familiar, every season, FabFitFun allows annual subscribers to pick their choice between different items to customize their box. If you aren’t a Select member (annual subscriber), FabFitFun will pick the item for you. Annual subscribers have until May 18th at 11:59 PM PST to make their selection. Annual subscribers will be able to pick between this palette, or a tarte Pro to-go palette and eyeliner set. (I’ll show you all the other options at the end of the review.) You have until May 18th at 11:59 PM PST to make your selection. Annual subscribers will be able to pick between this face scrub, a resistance band, or a wallet. (I’ll show you all the other options at the end of the review.) You have until May 18th at 11:59 PM PST to make your selection. I’ve sampled this before, and I love the formula, so this was an easy pick for me! It’s a super-fine exfoliant, gentle enough to use 3-5 times a week, and it makes my skin feel incredibly smooth and clean. Annual subscribers will be able to pick between this peel, or a hair protectant spray. (I’ll show you all the other options at the end of the review.) You have until May 18th at 11:59 PM PST to make your selection. Verdict: This box has a retail value of $348.99! As always, I’m so impressed with how many items FabFitFun delivers for $49.99. I don’t know how they do it – this box is full of name brands I love so much I pay full price for, and I love how much customization they are now offering to subscribers. I don’t think there are any bad options in this box either – I love the towel + train case equally – if you are thinking of adding the other one to your box for an additional $10, I recommend it! In my opinion – this is the best box FabFitFun has ever done! Want to see any of these items in action? I’ve been adding videos to our Instagram stories answering reader questions about the box. Check them out here (click our logo/profile picture) and feel free to send me any questions you’d like me to answer in a video! Can you still get this box if you sign up today? As of today, 5/16, yes! What do you think of the Summer 2018 FabFitFun box? Which items are you picking? These makeup train cases are such nice quality! The materials (shell is PVC, lining is polyester) make it easy to wipe up any makeup spills, too. The top section of the case includes a section for makeup brushes and a zippered compartment. This case measures about 10 inches long, 6 inches across, and about 5 inches deep. It fit all my makeup with room to spare! This ring is 14K gold plated, with a brass base, and Certified Natural Cultured Freshwater Pearls. FYI – it’s adjustable, but I found it easier to make larger, than to make much smaller than a size 7. First, love this packaging! So luxe! And the formula is ingredient-conscious! It’s a decadent salt-based scrub that is infused with coconut oil to give you lots of moisture. It’s excellent for serious exfoliation, but if you have very sensitive skin, I’d recommend sticking with a milder, sugar scrub. This is a mix of 3 mattes and 3 shimmer eyeshadows. And just like the other tarte palette, the pigments are great and the formulas are easy to blend! How cute is this eyeliner pen cap? The eyeliner goes on smoothly and is super inky and pigmented – exactly what you would expect from a great liquid eyeliner. And it doesn’t budge once it sets! This wallet has a wrist strap (seems perfect for travel and keeping track of your room key + cash), and gold accents. The material is vegan leather, and it measures 2.5″ H x 4.5″ W.
It should be able to hold a few cards and cash. This resistance band is another great travel item! And FabFitFun TV (a free channel for all subscribers) will feature workouts for this band! This spray is a 10-in-1 thermal heat protection spray that provides an invisible weightless barrier to help combat damage caused by heat, UV rays, humidity, pollution and free radicals. I love that you can use it on both dry or damp hair, too. And it smells fab! Ok, that’s it! Thanks if you stuck with me the whole way through! Let me know what you think of all the options! Please help ! What is the little pink thing that came with the Foreo ? If you scratch off the silver area, it is your code so that you can register the Foreo online. (For warranty) and product manual download. If anyone one would like to swap their tarte eyeshadow palette for my tarte contour palette let me know. Anyone want my towel for their train case? I’ve been reading reviews for this sub for some time now and I just don’t get the hype. You can find similar items at your local Ross, tjmaxx etc, especially all these beachy items. This foreo thing is no better than other similar things available at any ulta or sephora store or i could put together more useful items myself for the same cost, which I often do. I think many people are just addicted and i would bet many sub items find a place somewhere never to be thought of again. Lol Ahhh how companies have learned how to manipulate consumers… My subs are mostly under $30 and more useful. Each to their own I guess. “Similar items” aren’t the same as THESE items however. The cheapest Foreo you can get from Sephora is $39, and the Tarte pro glow palette is $45. Sub boxes aside, I would pay more to purchase from a good brand such as Tarte versus buying a “similar” and lower quality item, especially when it comes to what I put on my face. I do agree that the train case and towel are overpriced based on what their suggested MSRP are. But for me, the Foreo and Tarte Palette make it worth it. Anyone want to trade their train case for my towel? I’d love to swap with you! Yay! I’m new to posting on the forum and am not sure how this works. Is there a way to private message you? Yay! How can we make this happen? I’m so happy, my box is on it’s way and I got the eye kit which was the variation I really wanted!!!! For some reason, I ended up with 2 of the caviar scrubs. I checked my order carefully, and I didn’t order 2. Did anyone else find that they had 2 in their box? My order was so large and likely complicated that it was a packing error. In any case, FFF didn’t want it back. I guess I’ll put it on eBay as I am NOT a body scrub person in the first place. I have very sensitive skin which thrives with moisture in my arid climate. I didn’t get 2 body caviars, but I did also receive a product I didn’t order. It was an African Botanicals muscle gel. I checked my original order and it wasn’t on there but it was on my packing slip and the shipping email as a “GWP”. I thought that was weird. I have that gel. I think it was in a FFF Editor’s Box earlier this year, or late last year. The MSRP for that caviar scrub is really high. I wish someone who loves body scrubbing had gotten two of them rather than me. I’d have loved bath or body oil… dry sensitive skin. I KNOW I didn’t order it because I selected the one that was a choice item for Select members and I wouldn’t have purchased something in add-ons so similar to what I was already receiving in my box! I would have loved a 2nd body caviar instead, lol. It would make a nice gift! It doesn’t even give you a skin age like I thought it would. It just uses the age you put on your profile. I’m disappointed. I thought it told you what your skin age is and not your actual age! Weird I thought this was the case but I couldn’t find anywhere in the app that I had set my age. Makes sense now though. I wonder if they’re still working through the kinks. It was 2 years older than my actual age. Possibly your skin age matches your chronological age. I just tried it again today and it said my age was 2 years younger. Yay! Yay my box came! Did anyone get the ring? Mine does NOT look like the one in the picture at all. That one is smooth and perfect. Mine has a ton of grooves and one pearl is even crooked. I was really stoked on this piece because I have literally zero jewelry but this looks really cheap. I got the ring and my pearls are straight. I’ve never owned freshwater pearls before, always having South Sea Tahitian pearls. What I thought, and still think about the grooves is that there’s some sort of nylon cord or the like holding the pearls onto the ring base. It may be that the company made the grooves for the cord to be stable ( although yours doesn’t sound like it is). With all pearls, makeup, hand lotion, perfume and all hair spray products ( applies more to pearl necklaces) will discolor and damage the layers of nacre on fine pearls. In 20 years, I’ve worn my best pearl necklace and bracelet maybe 3 times. FIne Tahitian pearls are so fragile for the cost that I keep them in our safe with climate control. Sudden temperature changes can also cause fractures. I’d expect this to be doubly true with the thinner and cheaper freshwater pearl surfaces. For the future just know that fff is notorious for sending cheap quality jewelry with insanely inflated values. Other than that love plated necklace a few years ago they have all ended up tarnishing or breaking quickly. ah i can’t find my comment so i’ll comment again. My box was “delivered” today but our terrible USPS person…guess what? They didn’t deliver it to my address, they delivered it somewhere else and its likely i will never see it again. I am always so sad when i see packages initiate with fedex then transfer to usps because it’s likely i will never see it. I am so upset because i got all of my choices and add ons too. So someone else is likely enjoying my box right about now! And just last week they delivered someone elses FFF box to my address, but I’m not a jerk and found it’s rightful owner! It’s not unheard of for a package to show as delivered in the Fedex tracking but not if you search with tracking # USPS assigns it. Sometimes it will show as delivered in the USPS system and show up in a day or two. There is a geolocation tag that shows where a package is when it’s scanned as delivered too. FFF has replaced items that are lost before but that’s not a guaranteed outcome and it seems to matter who you speak to. I hope you get your box and add-ons this weekend. I am SO sad. Usps in my neighborhood is awful and they delivered my box to someone else! I have no idea where it is! I looked at my sneak peak online and was getting excited everything I had hoped for plus add ons! I’m seriously so upset. Does anyone know if FFF typically replaces the same contents? Then at least aLL is not lost. Super weird, last week they delivered someone else’s FFF box up my address and because I’m not a jerk, I found her and told her I had her package! So I just got my box yesterday. I got both the Elemis and Vasanti Enzymatic cleansers. My friend also received the same and contacted CS and they are sending her a new item, since they are practically the same. I just contacted them and they told me they only replace if defective or damaged and that they are not the same product. One is an enzymatic cream exfoliator and the other is a enzymatic exfoliating cleanser. In what world do those not function the same? Yes, one you leave on for 10 minutes and the other is a wash, but I do not need two of a product that function with the same purpose. I was told they are randomly assigned in the warehouse, so I gave the feedback that when there are two similar products, the box should be checked to make sure that the items are different for the subscriber. I’m passing them along to friends, but I’m just disappointed that I didn’t receive something else that I could have used with more thoughtful curation. This is my first box and I don’t have it yet (SmartPost is taking the extra long route wit this one) but looked at my reveal and I’m getting both of those and thought the exact same thing. Both have the word exfoliator on the bottle so how are they not similar? I would have preferred the wallet or resistance band. I have a dumb question- I just opened my foreo and it came with a separate pink rubber disc but I can’t figure out what it’s for… I don’t see a way to attach it to the device and unless I’m overlooking it, I can’t find anything in the tiny manual that came with the device. Anyone know what this is for? I did see that, but do you know what the disc itself is for? Or is it just decorative packaging for the registration code? It’s actually a magnet. Foreo is soooo poor w/proving much info w/their actual products, but if you go to their official website it’s helpful. You can also find the info you need to register on the sticker attached to the bag the device should have come inside of & on the bottom of the device as well). I URGE YOU TO REGISTER!! I had a Foreo Issa that wasn’t charging any longer & the warranty covered that problem & yes, I admit it did take a while to get a replacement device, but I did & I wasn’t charged for shipping either sending my item to them or getting my replacenent. The company is not truly a US company… I forget where they started, & don’t feel stupid because when I received that replacement toothbrush there was one of those inside (there wasn’t one when I originally bought my toothbrush) & I had no idea what it was & registered my new toothbrush using the info from the bottom. I found out it was a magnet by experimenting w/my fridge & I sent a message to customer service after I learned there was a code on there that gave me a discount on a future order, but she gave me the code & I don’t know if I ever scrached that thing. I know I did nothing w/the one that I assume is in my new device because I’m praying someone who got a blue one wants a “Sunflower yellow” one as I listed mine right after I received it yesterday so upset because I just knew I’d get that colour & my other two Foreo devices are blue hues. So COLOUR ME DISSAPOINTED!! 😉 pun MUCH intended!! I don’t think it’s the registration code because I tried registering using this number. The registration number is on the actual device. Got mine today and am thrilled! I’m seasonal but I ended up getting all the items I would have picked anyway. Cleanser, contour palette and peel! I got the same as you and that’s exactly what I was hoping for. Woohoo! Now I wonder if you can use the cleanser and the peel on the same day, wondering if it’ll be too intense?! BEWARE: I canceled my subscription on 3/29 which should have been plenty of time to insure not getting another box. They sent the summer box anyway. And charged me $49.95 for it. There was nothing in it that I want. They said that I could pay almost $15 to mail it back to get my $49.95 back. Their mistake at my cost! Would love to trade you the Oliver Pita Play Hair spray for the peel! My first box is on the way. I didn’t know about the $10 off code nor the free bundle offer so I paid full price. I’m 62 years old and they chose the contour palette for me along with some enzyme cream of some sort and a face peel? The face cleaning gadget I knew I was going to get and not use but was hoping they would at least choose the eye shadow considering my age. The ring can’t be worn with hand lotion?? I saw that on a you tubers unboxing. That would have been helpful to know in advance although I’m not sure what I would have done with the other two choices. I’ve seen so many nice pieces of jewelry in other seasons boxes, oh well. I just cancelled. I so wanted to like this box since I have been watching the videos and debating on ordering for over a year. I just don’t think the makeup case is worth the $50. Got my box yesterday. My HUSBAND of all people saw my skin after I used the Foreo, and got a little bit mopey that he didn’t have one of his own. Instead of rolling his eyes at my subscription box, he asked me to order another one. I did. Hoping I get a different variation from the first one so I can try different things. That is a win win situation sister! Hope you get some new items! Everything looks great! What is the circular flat piece of (rubber?) that comes with the Foreo item – the item with the code on it? I just got my box today. I was surprised to find a bonus item Liz missed. It’s a paper straw wrapped in white paper advertising giveasip.us. since its white and with white sizzle its hard to see. I have never subscribed to this box. Can I still get it and customize it?? If its available you can still get it but customization ended 18 may. Boxes are starting to ship. My 21 lb. order should be arriving on June 2, Saturday. I’m thrilled, but hubby will be home- the only mega- shipment I’ve had from them and the shipping certainly is faster! I’m impressed with the projected delivery date and May shipping. If that weight is correct that is a massive box. Mine only weighs 7lbs and I had around $100 in add-ons. I had $495 in Add Ons plus box additions, so yes, the weight is correct. LOL, the box full of goodies is still on the floor in our bedroom. I have to rearrange some vanity room cabinets to have space for the new makeup, skin care, and hair products. If anyone got the Kimono ( in pink and gray stripes or just gray and cream stripes) there is a stressed area where the label is sewn in on mine. I was going to have my seamstress at our cleaners add a stitch or two where the fabric has teeny holes, but the business changed ownership and she’s gone. Easiest fix is probably just to remove the label very carefully as this is nice fabric with linen content. I agree with those who are saying the Vasanti product and the Elemis product are too similar. I didn’t order the Vasanti product for that reason ( plus didn’t like the sample I had in a Birchbox once). Mandy, were all of your add-ons just thrown in a box w/some used looking packing paper & some bit bubble “protectors?” I had ordered not quite as much as you, but close, & bottles, & I was soooooo dissapointed by the wrapping of items (or lack there-of). So when I had to address another issue I went off…. I will not give any of my friends that discount card because they have soooo dissapointed me box-after-box that I don’t want to be associated w/the box. Then, I thought I should have done @ video unwrapping. The actual Summer box was a mess the tissue paper all shredded looking & the bag the FOREO was inside was stuck to all the shredded wrap (which the tissue paper was looking like). They’ve made sooooo many improvements, but they don’t listen to feedback & if I did a video & posted maybe they’d realize how dissapointing opening a box like that truly is. I have one box left in my annual subscription & IDK what they can do to keep me. I may soon be subscription box free & I think I might just love it & stick to buying my cosmetics from high end retailers when they pull out their fab GWPS. Much better spending my $$ & getting something I will use. It’s sad to me, I was with them since 2014 when it was so cheesy those cards & the boxes POPSUGAR started to change for the better, but I ended up leaving them too eventually, like many other boxes. I just couldn’t deal w/the clutter & starting to swap again this year I still feel burdened by clutter… it’s like my items are procreating in the room where I keep the items!! We shall see what happens. I wish I didn’t like the add-ones because that’s what sucked me in but I only kept one item from the prior 2 boxes & this one was MUCH better, but I still plan to list more items to swap. How many palettes of make-up do they think we need? Even giving choices I noticed the exfoliating product overload. I got the one scrub already as part of a trio of the brand as an add on in the winter. I wonder if they even read & heed feedback—they ask for ebough but do nothing about what I know I say. I’m merely one gal, but I bet my issues aren’t only felt by myself. I think that’s wrong about your kimono & I could easily fix something like that for you, but the point is you shouldn’t receive defective items even if add-ons!! The excuse it’s discounted shouldn’t be a catch all excuse!! To me that’s unacceptable & unprofessional. Believe me I could go on all day, but maybe I need to put them through an actual unsatisfactory experience by doing a video when I open my final box….. fingers crossed they can redeem themselves, but now we are nearing 2 years where I’ve told myself this. My box, weighing 21 lbs. according to Fed Ex., has shipped and is supposed to arrive on Saturday ( figures- DH will be home). I’m excited but concerned as well. YIKES. I love the face sunscreen. I’ll have to swap for it!! Whats the App for the foreo luna ? I just got my box and I’m dying to use it but can’t seem to find the app … help ! Since the product is super new the app isn’t quite ready yet. I haven’t looked for an update on when it will be released, but the last thing I saw from FFF a couple weeks ago is that the app should hopefully be released by the time the bulk of our boxes are received. FFF subscribers are the first to be able to try the new Foreo 😃. I’m sure FFF will post more info as the app becomes available. Not a new product at all- these have been out for a year. The company is HORRIBLE. Terrible customer service! I think the specific Foreo we received is brand new and FFF customers were some the first to receive it. The concept of the foreo connecting to an app is a first starting with these, so there will be bugs to work out. I usually hate getting the first generation of anything in regards to electronics b/c there are so many bugs. FOREO for you app works! They said until the 4th, you can definitely use that one. How? Help please!! I have the Foreo UFO (lucked out by getting it through the kickstarter!! And it will only show the app for the UFO one! I noticed something… I have an iPad Pro & my settings are for iPad only so I looked at iPhone apps & saw something called FOREO (I can’t recall the rest of the name). I’m waiting for my device as I’m trading to get the colour I wanted (to match my other devices), but I looked & the FB WAS HORRENDOUS. I’ll wait for the iPad app because I hate phone apps because they look so funky on the iPad Pro. Anyway, I have a LUNA anyway, but was soooo intrigued by the age analysis, but don’t want to be told something that’s going to depress me. Hoping they will fix the bugs & I think the sooner the better—it seems brand loyalty is impacted by this app not working from some comments I read. Search for Foreo in the app store. How do you use this if you don’t have the app ? Have anyone used it yet. You can use it to cleanse without the app, but it won’t analyze your skin. Just turn it on (power button is on the back) and go! I’m really happy and excited for this box! Can I just say though that some of you guys are really annoying over on the swap section. There’s people that load up on these items then put long snobby paragraphs on how ‘I’m saving this for something special so please don’t bother to ask to swap with me if you only have samples’ and so on, when you don’t even have the items in hand yet and we know you got this out of a box not like you shop at Neiman Marcus. It just smacks of greediness and if I’m reading long specific detailed rude paragraphs on all your listed items I’m definitely not going to request a swap – at any time! Friendly people all the way for me.